Creatine is an organic compound both synthesised and used by the human body for a variety of tasks, the most important one being its use in recycling a substance called adenosine triphosphate. (ATP). ATP can effectively be thought of as the charge stored in a battery powering your muscles. once depleted the muscle will cease to function as effectively. When your body uses up ATP, it creates a substance called ADP. 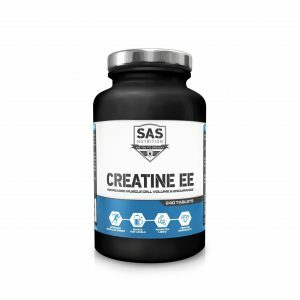 which creatine then binds with to turn it back into ATP. This means when you load up on creatine, you can generally lift heavier and for longer as your body is able to regenerate ATP more effectively. WHY WOULD I NEED CREATINE? Creatine is traditionally used within the bodybuilding and weightlifting community to break plateaus encountered during training due to it’s muscular strength/endurance enhancing properties. There are multiple ways of consuming creatine, the human body on average generates about 1g per day on its own and most people with an omnivorous diet also intake about 1g per day via their diet. generally speaking to notice results it is helpful to supplement an additional 3 or so grams daily. these can be ingested in various ways. Ethyl Ester Tablets – These are popular for people who do not wish to preload on creatine for extensive periods of time, studies have shown it to have a slightly greater bioavailability than monohydrate. SAS Brand Ehyl Ester Tablets require 6 tablets a day, 3 before and 3 after a workout. Monohydrate Tablets – for those who aren’t a fan of the powder and want to save a little money. 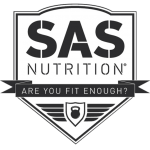 SAS Brand Monohydrate Tablets require up to 10 tablets a day. Monohydrate Powder – Normally unflavoured powders which can be mixed into protein shakes or taken on their own. 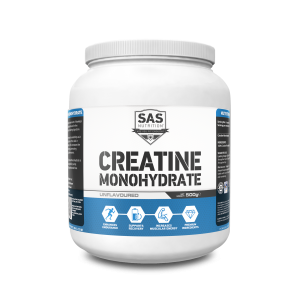 SAS Brand Monohydrate Powder is unflavoured, with a 5g per teaspoon serving size. 20g per 5 days must be taken during a loading phase and 5g per day must be taken during maintenance. The most notable is water retention, your body will begin clinging on to a lot more liquid than it previously had been doing. You may notice this especially if you are at a lower body fat percentage – your abs will become less defined, as will any kind of visible lines on your triceps/biceps. This will go away very quickly after you stop taking the supplement and is only temporary. Unless you are frequently taking well over the recommended dosage for a long period of time – in which case it may be possible to damage your kidneys. As such avoid taking high doses over longer periods of time and give yourself a couple of weeks in between cycles. If you are consuming any medication which may affect your kidneys it is best to avoid creatine entirely and stay on the safe side. The most common medications that affect the kidneys are anti-inflammatory drugs such as ibuprofen. If you have parkinsons disease, it is best to avoid taking caffeine whilst on a creatine cycle. Creatine should be avoided whilst pregnant/breastfeeding purely because there are no reliable studies to comment on the safety of this, this is subject to change in the future if more data becomes available in this field. Creatine draws water out of your body and as such it is important to stay hydrated whilst using it, try not to work out in the heat or do excessive amounts of cardio whilst using creatine unless you are making a conscious effort to stay hydrated as you may feel the symptoms of dehydration setting in after a period of time. Below is a summary of the questions many people both online and in store have about creatine. As it is in an incredibly popular supplement and has been for a great period of time; a wealth of rumours, misconceptions and misunderstandings have been allowed to build up over the years. Particularly many surrounding the supplementation of creatine for women. Which deserved it’s own specific page as a result. Can Too Much Creatine Be Bad For You? Too much of any supplement or substance (Including water) can be bad for you, however there have been a variety of human studies in which people greatly exceeded the recommended dose of creatine for lengthy periods of time with varying results. The consensus seems to be that creatine is most likely safe to take in the region of anywhere up to 25 grams for a period of 14 days, however lower doses can be maintained for longer. No trials appeared to have been conducted where the upper threshold was exceeded as they are unnecessary, there is a definitive saturation point long before this in which increasing your creatine intake will make very little difference to your performance. This is a popular theory due to the fact some athletes have reported hair loss beginning after using creatine – absolutely no studies have been able to verify this and the simplest explanation appears to be that whilst not directly causing hair loss in men, people who are actively exercising are increasing their testosterone levels. This can cause some men to lose hair and would happen with or without creatine supplementation as this is an ailment individuals are genetically predisposed to. No. Steroids are traditionally substances that greatly elevate the presence of testosterone in your body in order to facilitate that synthesis of more protein and enable quicker recovery periods. Creatine is a natural substance produced in the body daily at a rate of about 1g/24 hours. Are There Benefits Other Than Strength? Rudimentary research indicates that creatine has neuroprotective qualities, and also seems to function as an anti-depressant (But only for women, weirdly enough.) Vegetarians who take creatine supplements report that it functions somewhat like a cognitive enhancer for them, this could be due to the fact that many vegetarians have moderate to severe creatine deficiencies because of the difficulty involved in obtaining this nutrient from food. Some research also suggests creatine may preserve the integrity of the cells in your body as they tend to swell up with all the extra water retention. 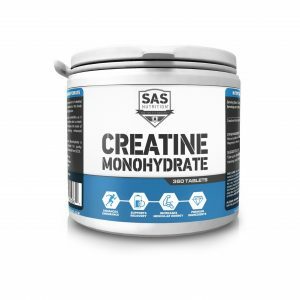 Can I Use Creatine For Weight Gain/Bulking? Yes, creatine helps you both obtain and keep lean muscle and grants you the ability to train harder for longer, which makes stacking on the pounds much easier especially if you’re trying to do so with a specific time frame in mind. Creatine will not affect your fat retention greatly but the water retention may give you puffed out appearance, as such when off-cycle you should expect to look slightly smaller than when on-cycle. There is however not a great deal of calories in most creatine related products so it will not cause you to gain fat. If you’re taking the traditional bodybuilding approach of bulking up by greatly increasing your body fat percentage and training hard then slimming down, this product will not contribute to your body fat changing very much. If you wish to take this approach you should also consider either a high calorie mass gainer or a different approach to your diet.